The first time I tried this dessert I died and went to heaven! It was my friend Chef Stefania Barzini from Italy who shared with me this delicious recipe that “takes you back to childhood”. There are a few variations you can do to make it dairy free. Use almond or coconut milk instead of whole milk and you will still hear the lullaby after the first bite! 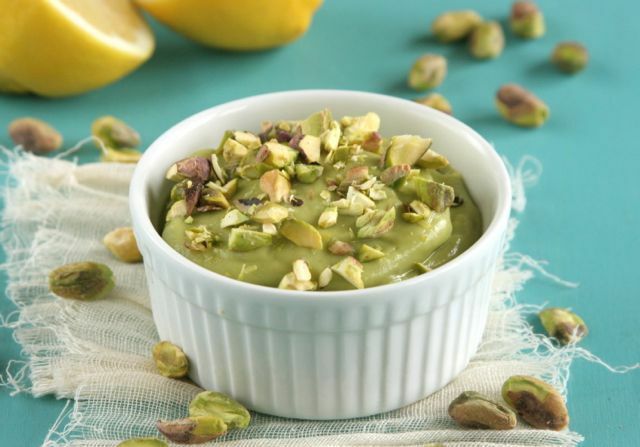 A very soothing and delicate flavor of almond custard with chopped pistachios on top. Whisk the starch, milk, sugar, and almond extract together. Cook in a saucepan, whisking constantly until to prevent sticking, until thickened but creamy (the custard should have the consistency of bechamel). Remove the lemon peel. If desired, put a small spoonful of marmalade in the bottom of each glass. Garnish with a piece of candied orange peel, a dusting of cinnamon, and a sprinkling of pistachios.